Eximius Miracle Oil is one of the best health supplements available in the world. 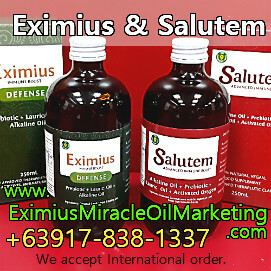 With all the testimonials, with all the lives saved and all patients who felt a lot better, Eximius Miracle Oil is gaining more buyers here in the Philippines and abroad! How much is Eximius Miracle Oil? do you have available branch near taytay palengke? Hi. Please contact us at 0917-838-1337 for meet up.